It's been a while since I had a post, but I wanted to write a review on a book that a lot of people are highly anticipating! It's definitely worth a read, and Novik fans should start (if they aren't already) getting excited for it! Goodreads Description: Miryem is the daughter and granddaughter of moneylenders... but her father isn't a very good one. Free to lend and reluctant to collect, he has loaned out most of his wife's dowry and left the family on the edge of poverty--until Miryem steps in. Hardening her heart against her fellow villagers' pleas, she sets out to collect what is owed--and finds herself more than up to the task. When her grandfather loans her a pouch of silver pennies, she brings it back full of gold. 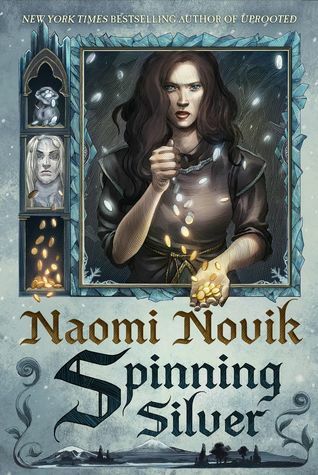 My review: Novik is undoubtedly a wonderful writer. There's a reason she is a NYT bestseller and her previous novel Uprooted took the world by storm. Spinning Silver is imaginative, rooted in Jewish history, and has some terrific characters. In particular, the main character Miryem and the soon to be Tsarina are very compelling and their stories intertwine to determine the fate of their world. The reason I wasn't completely head over heels is because it was a little long (like Uprooted), and the other 4 perspectives were rather lost on me. To me, it took me out of the story. Also, there was nothing denoting different perspectives so it was jarring to just have paragraph breaks-- however, I read the advanced reader copy and the finished copy may be different. Overall, a beautifully written and unique retelling of Rumpelstiltskin with two really great, strong female protagonists.